The Sprog's Life : Welcome to Frimley Park Cf Unit! The Brompton didn't have a bed for me and was looking to be at least a week until I would be admitted and there's no way I could wait that long! Hospital upset me a bit, felt like they thought I simply couldn't be bothered to start home ivs which is never the case, at this stage I'm not going to prevent myself from getting better, but I literally didn't have the energy to get up for 6am ivs and managing to draw the flushes up etc, it has been hard enough to do simple tasks like going to the toilet. Also my weight was only 36kg so couldn't afford to loose anymore and for the last 3-4 ivs I've had, sickness has really affected me and I've been put on drips for the first 24 hours of starting ivs, I don't have that at home, I don't have all the treatment to help me with sickness, also being sick takes up all my energy and wipes me out so how am I supposed to deal with all that and make sure all my other treatment is kept on top of. It's just too much to deal with. Home ivs are great when your needing a top up or after a week of being on ivs and everything is settled but was just not realistic option for me to start this time, yet I was made to feel like I was refusing to help myself from my hospital. So I was told to go to my local which is scary enough and don't trust the healthcare there one bit, when I was admitted last time they blocked my port , I had to flush myself as they just left me and hardly saw anyone wash there hands and I was put onto a ward and I'm so paranoid about bugs these days now I'm on the transplant list, can't have anything ruin my chances!! That's what has brought me to Frimley Park Hospital. They have a CF unit here that I have heard about before and know a few girls who go here so I thought well if Brompton won't have me il try get in here. So Wednesday I turned up to a&e with my mum around 5pm ish and was seen straight away, done my obs and was on oxygen had a bit of a coughing fit and my Sats dropped quite low and they rushed me into resuss, I knew I was fine it happens everytime I get a coughing fit but they panicked. They got me out of wheelchair and straight into bed then done everything to me, stuck a cannula in my arm, bloods, X-ray came to my bay bit, then whacked oxygen up gave me nebs constantly having blood pressure going off, my heart rate and sats made the machine constantly bleep, then they stuck me on fluids. Was all a bit mad...all I wanted was a bed on the cf ward 😜 lol can't fault them though the care was ace! So it's now Sunday night/monday and I'm loving it here. The care is amazing! They only have 6 rooms and its a specialist cf unit and there's only 2 of us with cf here. Infection control is so good, they even change my neb mouthpiece after every neb which I thought was a bit OTT but they said well you have an infection so you don't want to keep breathing same bugs back in, suppose makes sense. But the BEST thing about the ward is the food, non stop trying to get me to eat, they have a sweet trolley completely free all paid for by the charity. The nurses are so friendly and actually happy here, everyone gets on with everyone, cleaners, managers, drs, dietians etc etc there's no attitudes or people treating others differently! So nice. And there so friendly to my family and people that visit, offering them drinks. So weird getting head around it all so different to the Brompton. 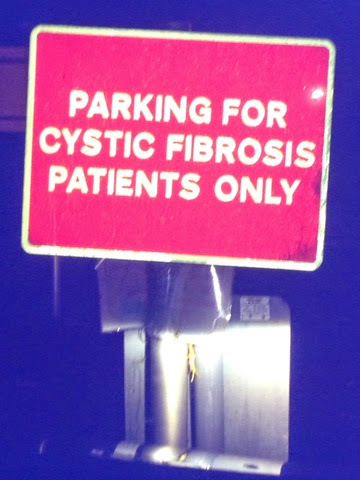 And they have specific parking spaces for us cf lot! So weird! So not use to this! Anyways I'm very happy here and hope im not transfered back to Brompton, there prob far too busy anyway so won't want to waste beds ESP if I'm in cf unit!